it's october . . . bring on the pumpkin recipes! i just love pumpkin in everything! pumpkin pie, pumpkin cake, pumpkin coffee, this list goes on and on. there is something so wonderful about pureed pumpkin married with all of the spices that taste and smell like fall. it's magical. 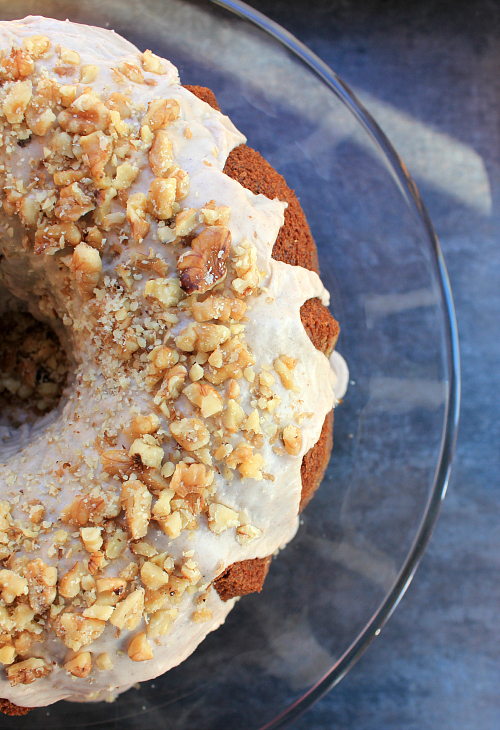 as soon as i saw the recipe for this pumpkin bundt cake i knew i had to make it. we decided to make this cake this weekend and take it for dessert when we were visiting ryan's family on saturday. the cake was so moist and so delicious. 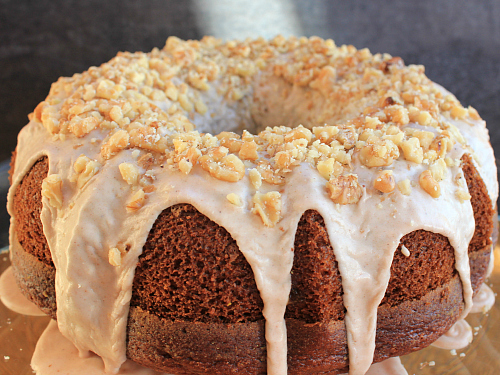 the cake had a great spice flavor, and the cinnamon glaze was the perfect compliment to the cake. it was such a great fall dessert! preheat your oven to 350 degrees F. in the bowl of an electric mixer, combine the pumpkin puree, oil, buttermilk, and vanilla. mix until combined. add the eggs, one at a time, mixing well after each addition, then mix in the sugars. in a separate bowl, sift together the flour, baking power, baking soda, and spices. gradually add the sifted dry ingredients to the batter. mix just until combined and no lumps remain. pour the batter into a greased and floured bundt pan. bake for 60 minutes or until a knife inserted into the center of the cake comes out clean. once baked, allow the cake to cool in the pan for 10-15 minutes before removing it from the pan and transferring it to a wire rack to finish cooling. to make the glaze, whisk together the powdered sugar, cinnamon, and cream. 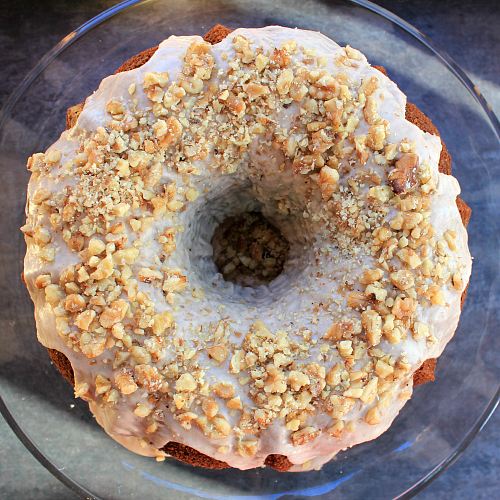 once the cake has cooled completely, pour the glaze over the top of the cake and decorate with additional chopped walnuts. That was such a nice moist cake. Even the spices were a good mix and not over powering. 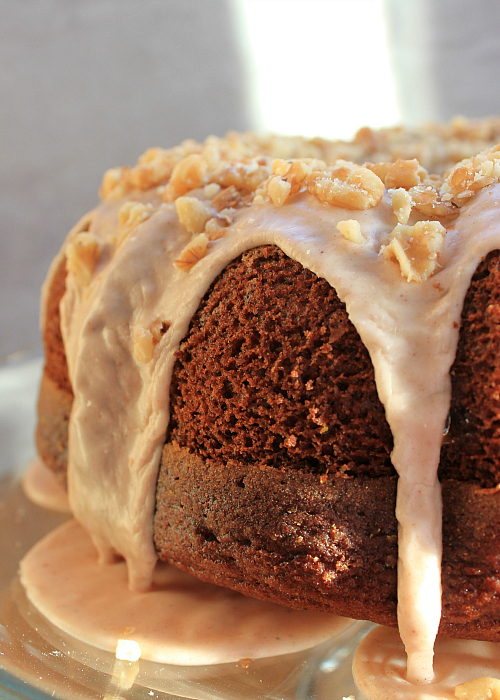 This cake recipe is a keeper - very yummy and moist!